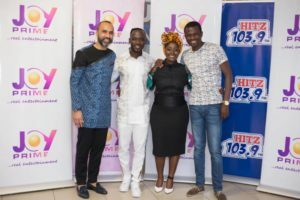 Okyeame Kwame, has inked a juicy deal with one of the biggest media conglomerates in Ghana. 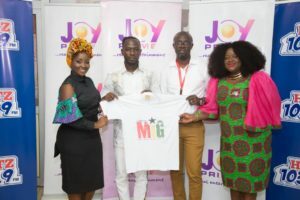 The UNICEF father of the year, award winning rapper and philanthropist has signed a partnership deal with Multimedia Group of Companies which comprises Joy FM, Adom FM, Hitz FM, Joy Prime, among others. This partnership is in tandem with Multimedia's campaign which is the 'Made in Ghana Fair which is run in November every year. 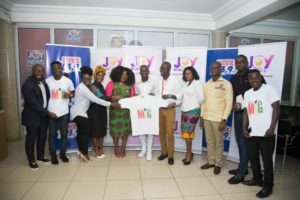 Joy Prime particularly, whose values are about leadership, integrity and community would a year, be with the OK brand on the journey of promoting everything made in Ghana. According to the Programme Manager of the Multimedia, Abdullai Awudu, "the Okyeame Kwame brand exudes creativity, that gives impact and creates new roads that lead to new heights." He revealed his happiness that, the Okyeame Kwame's campaign ties into theirs and would do all they can to help make the agenda fruitful. This project has the full backing of the Ghana Tourism Authority and Ministry of Trade and Industry. As part of this campaign, Okyeame is getting ready to release a 10-track album in December 2018 to encourage people to patronise Made in Ghana products. Already, his 'Made in Ghana' single which features Kidi is topping various music charts in the country. A lot of people, since the inception of the project, have lauded Kwame for such an initiative to whip up the national pride of Ghanaians. This initiative shows how concerned Okyeame is about Ghana's development. Okyeame Kwame is also a World Reader Ambassador, Tourism Ambassador and Climate Change Ambassador.